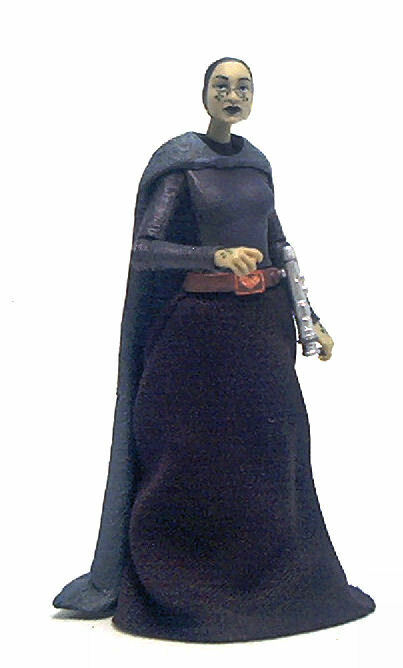 Barriss was not included in the 2005 Revenge of the Sith collection, since she didn’t appear prominently in any scene (I think she can be glimpsed as a background figure at the opening scene in the Battle of Kashyyyk). Jump forward six years and we finally get a perfectly good version of the olive skinned Barriss Offee (VC51), as part of the seventh wave of figure in Hasbro’s Star Wars Vintage Collection. Right out of the gate, I will say that this is the prettiest female action figure I’ve gotten in quite a while. Barriss is sculpted wearing a form-fitting garment that has a really distinctive fabric texture sculpted onto it. On the upper body you can make out seams and panels, but the legs are rather plain in comparison and lack the elaborate textures we see on torso and arms, although the boots are surprisingly detailed, considering that most of the lower body is meant to be covered by the heavy fabric skirt. Barriss’ face is simply beautiful, probably even more so than Nalini Krishnan’s, the actress who played the character in the films. It has something to do with the way the material absorbs and reflects the light, I think, but it also keeps a clear resemblance there. 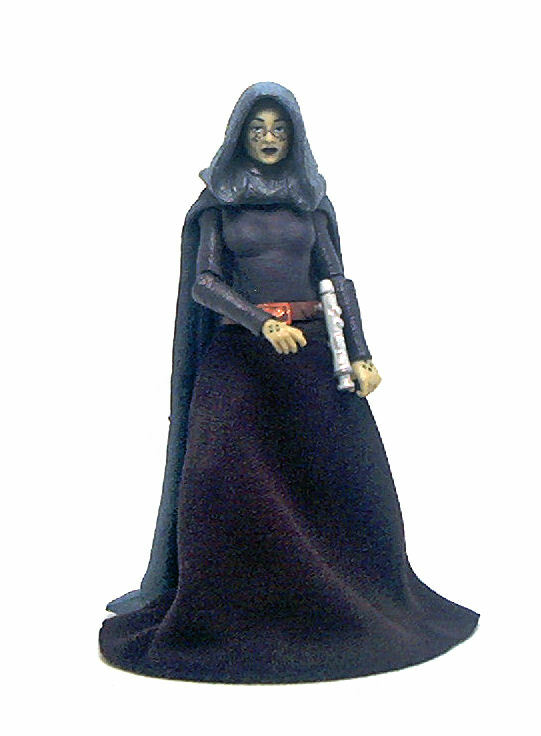 Back when the prototypes of this figure were shown, the original intention was to have her wearing a full fabric hooded cloak, but due to the difficulty of getting such a piece to drape correctly in this scale, the Hasbro team decided to go with a plastic molded cloak instead. 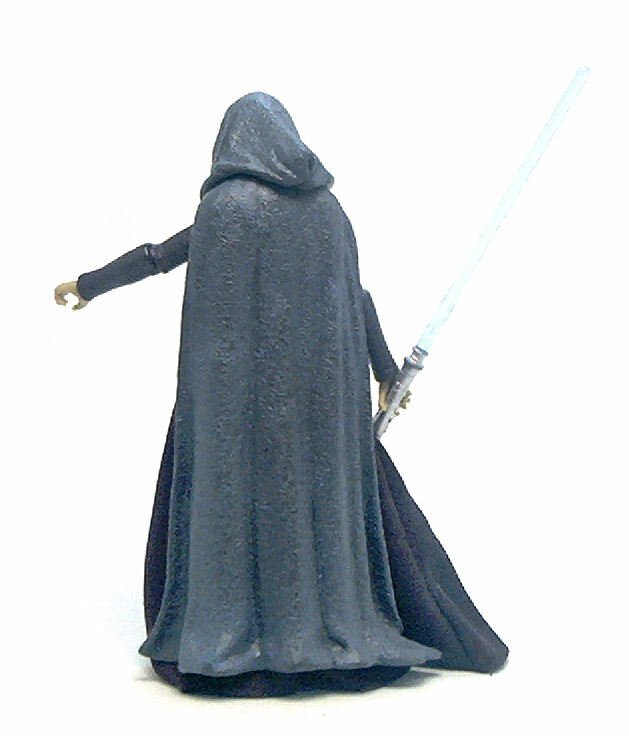 The cloak is comprised of a removable hood and a plastic cape made from the same material, with a fairly complex texture sculpted on both of them. The neck joint has a surprisingly good range of motion, considering the interaction with the plastic hood and cape. She can turn and tilt just enough to achieve subtly nuanced poses. Barriss has fairly minimal paint applications done to her, but for the most part all of them are neatly done. The one thing one has to be careful with is the alignment of the facial tattoos. Some sloppiness is to be expected, since this is application requires a fairly small paint mask, and not even the make-up worn by the actress was 100% perfect, but I saw at the store a couple figures that had the dark dots running way too low on the nose, instead of going over the bridge. 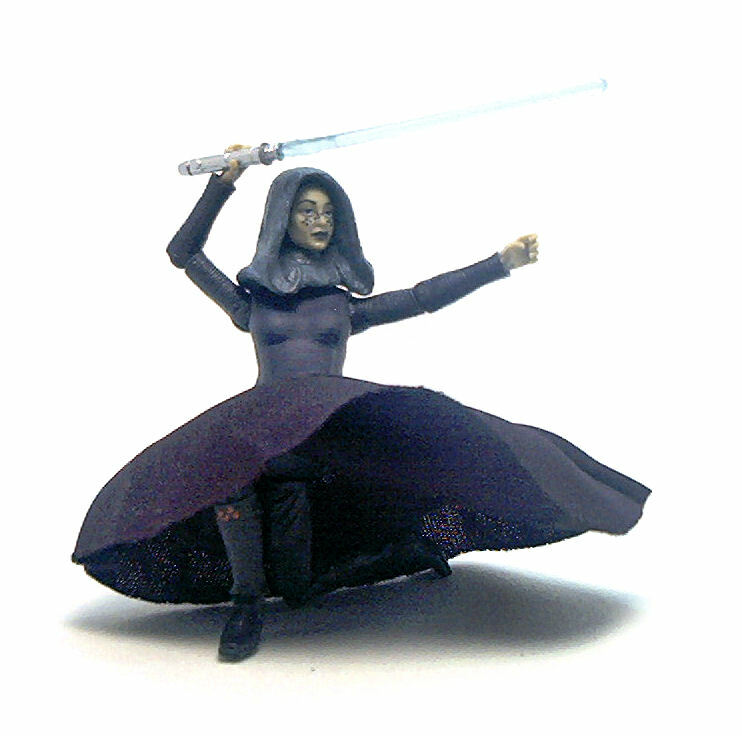 Besides the cloak and hood pieces, Barriss Offee comes with an active blue lightsaber with a very light blue blade, and a silver hilt to put on the her waist. Overall, I am very pleased with the way this figure turned out, even if the plastic cape piece forces her to remain mostly standing upright. The fabric skirt piece is also rather wide and certainly a bit too long, but it doesn’t get in the way as much. Excellent review of my most favorite Vintage Collection figure. 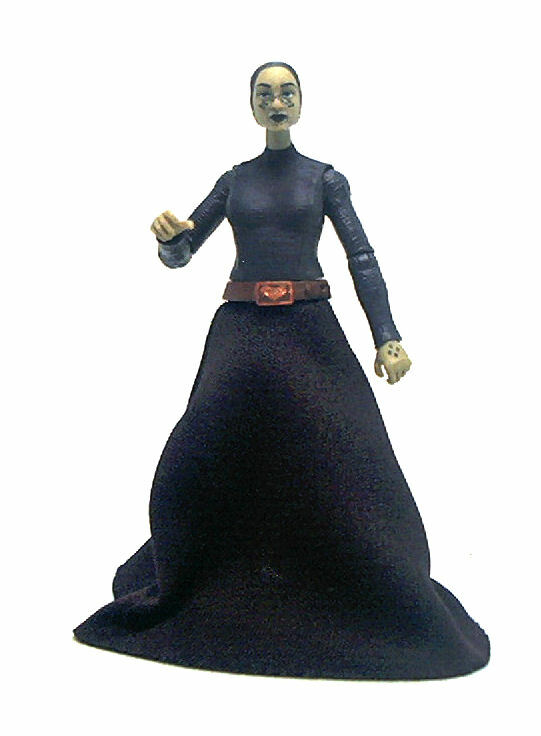 I’ve been told the original pressing of the Barriss figure had a face tattoo painting error on some if not most of those figures, but was corrected when it was reissued around the time the “Revenge” cardbacks came out in retail stores. I have two and pretty sure mine were both original issues (one I kept carded). Yours looks crystal clear perfect, so I’m assuming you got the corrected. I may have to order one that was recently made so I’ll most definitely have the better one – I really can’t tell with the two I have. But I’m so thrilled to have gotten a decent Barriss figure that I’m not really noticing anything wrong with it at all. I still have yet to remove the hoodie. 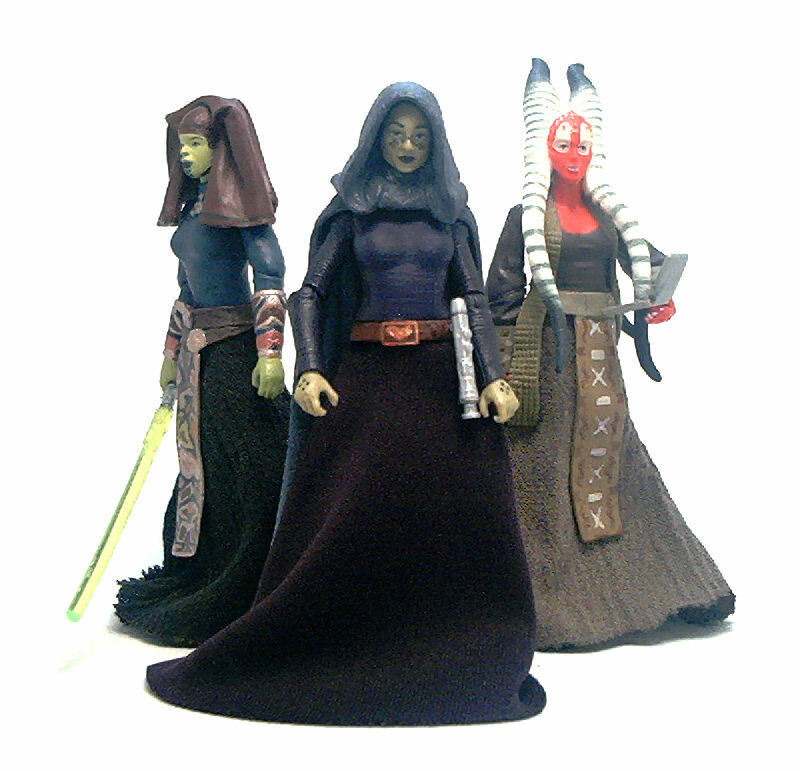 And it’s a shame she didn’t come with the original black soft goods Jedi robe that she was first shown wearing (looks a lot similar to the material used on the Luminara prototype for maybe 2014 at last year’s toy fair). I may have to cruise JoAnn Fabric and find a similar material and customize one myself. Nice review and photography, I’ll bookmark and look forward to other reviews. I’ve thought about reviewing a few random Star Wars figures, myself – once I get my newly created classic gaming reviews, etc. blog going.